At Plantation our favourite season is Christmas. Nobody displays and sells Christmas trees like we do! We carry an incredible number of freshly cut 100% Canadian grown sustainably harvested Christmas trees ranging from 2 to 14 feet tall. Our Speciality is Fraser Fir and we are known for our quality and service. Every tree leaves the lot with with a fresh cut on the bottom to ensure freshness. Trees arrive every year at the end of November so don’t wait until the last minute, get them when the selection is best. Our trees have been sustainably grown and harvested in Canada by family run tree farms. We store our trees in the shade if possible and open them up for you so that you can see for youself the quality of our trees. We feel confident with the varieties that we carry that they will hold their needles longer than any other variety on the market. 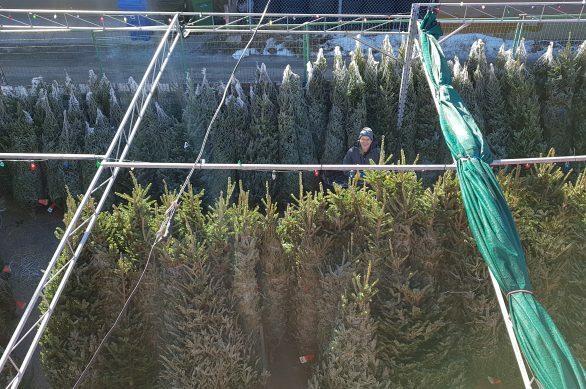 We care for our fresh cut Christmas trees the very best we can (and that is no easy task in our dry, windy and chinook climate). From standing them up, to storing them in the shade we do our utmost to make sure you go home with the perfect tree that will last as long as possible in your house. Each tree will be freshly cut to ensure the most water will be drawn up and the tree will not dry out. We are committed to providing outstanding support and customer service. We are here to help you pick out the perfect tree for your height and space you have available. 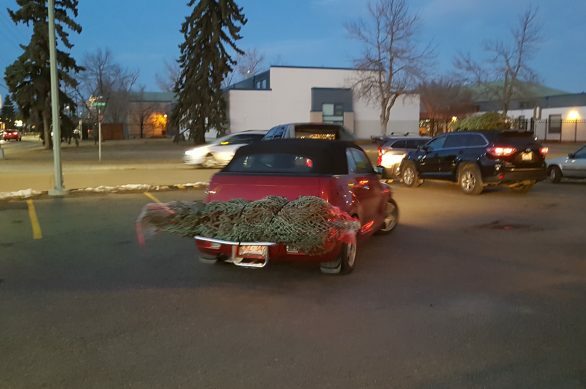 Our professional staff is also happy to take your tree right to your vehicle and tie on to roof rack if you like. We want you to have the best customer experience we can offer.